Things are complex and multi-facetted; anyone who wants to tell you otherwise is probably either fooling you or themselves (or both). Einstein famously said “Everything should be made as simple as possible, but not simpler.” Along the same lines Oliver Wendell Holmes said “I would not give a fig for the simplicity this side of complexity, but I would give my life for the simplicity on the other side of complexity.” The semi-paradoxical nature of these quotes gets to the heart of this Talking Point. How do we take complex ideas and make them accessible? I suggest it’s not by dumbing them down but rather by smartening them up. Aaron Dignan delivered a speech in NZ a few years back for Spark Digital. The talk is great and unpacks a pop-culture version of complexity theory. Essentially, Dignan is saying that the immune system, ants, and the interweb all share qualities of complexity that make them great. Complex adaptive networks (like your business or market) share the qualities these three complex systems demonstrate. You can read more on complexity theory online, probably the best starting point is the paper Complex Adaptive Systems by Serena Chan. It’s not by dumbing them down but rather by smartening them up. Paul Chippendale from the Minessence Group created the A Values Inventory (AVI) framework and defined the term ‘minessence’. It means to take complex ideas and/or technologies and simplify them so as to benefit others. This is a great word and in the simplicity family. 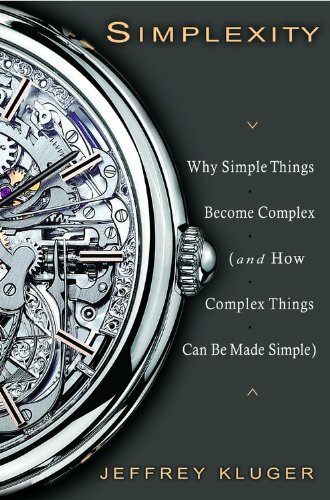 Jeffrey Kluger unpacks the idea in greater detail in Simplexity: Why Simple Things Become Complex (and How Complex Things Can Be Made Simple) and applies it to a range of applications from economics and medicine through to sports and human behaviours. Michael Henderson, co-founder of Minessence, was facilitating a leadership meeting for Thought Leaders in Bali a few years back. Each time we got bogged down he would focus the group in on this central idea of “What questions are we answering?” This approach allows you to manage multiple agendas and discussion points and yet still focus the group. Both the British rowing team and the New Zealand Americas Cup challenge team famously put one question above all others: “Does this make the boat go faster?” Know your primary question and the overwhelmingly complex gets narrowed down to one decision at a time. Know your primary question and the overwhelmingly complex gets narrowed down. Most complex discussions get bogged down in content. Great leaders drive the conversation around an overarching context. Whilst the stuff being discussed will always be complex, the themes or most abstract version of the conversation are typically quite simple. Whenever there is a lot of detail or dispute around a topic, ask yourself “Do we share the same context?” It’s not so much about being on the same page (content) but rather getting to consensus around the context and then allowing creative abrasion to drive the best decision. Adopt existing frameworks to filter conversations. The world is being disrupted, no doubt. Our quest for simplicity is understandable. Large organisations and groups need to understand that they are complex, adaptive networks. Navigating complexity requires something more than calling a meeting, sending an email, or delivering a Powerpoint slide show at a conference. Leaders need to be able to surf the wave of complexity by smartening up the discussions. These three tools may help you smarten up the complex and get to actionable decisions.